Roughly 300,000 Americans each year experience sudden pancreatic inflammation that requires hospitalization, and up to 25 percent of that group will experience another episode within several years. Fish oil does not cause pancreatitis; gallstones and heavy alcohol consumption account for 80 percent of cases. In fact, in some cases, fish oil may help treat pancreatitis. If you're considering adding it to your treatment regimen, get your doctor's permission first. A low-fat diet is the nutritional therapy commonly recommended to control symptoms in people with chronic pancreatitis. The typical limit is 50 grams of fat per day, but your doctor may set it as low as 30 grams based on your individual tolerance. Bump up your vegetable and fruit intake and stick to lean foods like egg whites, beans, soy, fish, skinless chicken and low-fat or nonfat dairy. It's also important for you to remain hydrated since dehydration triggers pancreatic inflammation. Equally crucial is that you avoid alcohol. High triglycerides is another cause of pancreatitis. In this case, fish oil may help prevent pancreatitis if you're at risk, or it may reduce the chance of a recurrent episode if you have a history of pancreatitis. 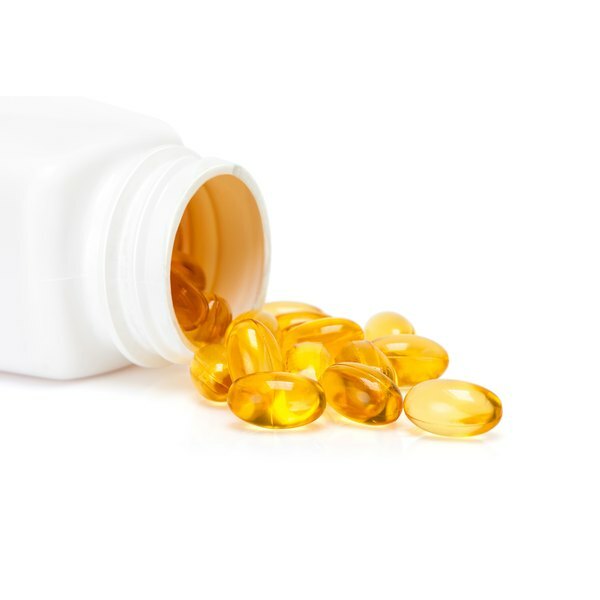 Fish oil is very effective at lowering triglycerides, according to an article published in the May 2012 issue of the Biochemistry and Biophysics Journal. The authors conclude that at a therapeutic dose, fish oil reduces triglycerides in your blood by roughly 25 percent to 50 percent after one month. Crystallized cholesterol deposits called gallstones are one of the major causes of pancreatitis. They occur when excess cholesterol accumulates in the gallbladder and forms hard, stonelike substances. Fish oil increases the production of bile acids in humans, according to a study published in the April 2006 issue of the Journal of Nutrition. An increase in bile acids helps prevent gallstone formation. When tested in animals, omega-3 fats like fish oil prevented gallstones by increasing bile acids and reducing a substance called mucin, which promotes cholesterol crystallization. The study was published in the November 2012 issue of the Journal of Gastroenterology and Hepatology. Another characteristic of fish oil that may help treat pancreatitis is its ability to lower inflammation. Researchers conducted a pilot study in which patients with acute pancreatitis took either fish oil or soybean oil. As reported in a 2009 issue of the journal Inflammation, they found that the fish oil helped regulate the immune response by significantly increasing the production of anti-inflammatory proteins. It also helped regulate other markers for inflammation. The authors mention that a larger trial is necessary to determine whether omega-3 fats would result in better treatment for acute pancreatitis.